Air India’s Dreamliner Aircraft, grounded since January after incidents of battery fire, may take to the sky in the next two weeks, officials said on Saturday. United States Federal officials have accepted Boeing’s revamped battery system for its beleaguered 787 Dreamliners and intend to lift a three-month-old order grounding the planes, Boeing said in a statement in Washington. “A team of engineers from Boeing is being flown into India and they are likely to start work to reset the new batteries on the six Dreamliners of Air India,” DGCA chief Arun Mishra said. Following the battery fire incidents on two Japanese airlines, the entire fleet of 50 Boeing-787 including six of Air India aircraft called the Dreamliner were grounded in January. Air India has already received the new battery kit, though the revamped batteries are yet to arrive, senior Air India officials said. A team of over 20 engineers are being flown into India by Boeing to help Air India’s engineering team install the new battery kit in each of the six aircraft, they said. “It will take almost a week to install these batteries on each of these aircraft. 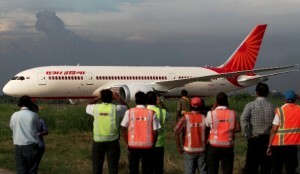 We start flying only after we get at least two of these aircraft operational,” Air India officials said.